Arrests have been made after we appealed for the public’s help to identify two men seen in CCTV images. Two men from Godalming have been sentenced to four years each after admitting to over 40 burglaries and thefts of nine cars across Waverley between October 2018 and January 2019. A man has been sentenced today (5 April), after he was found guilty of stalking in October. He was convicted in his absence as he failed to attend court. ​We are appealing for witnesses following a public order incident in Thames Ditton Wednesday evening (3 April). We appealed for information following a report that a man indecently exposed himself to a teenager in Hinchley Wood on Wednesday, March 20 and since then there have been further reports. 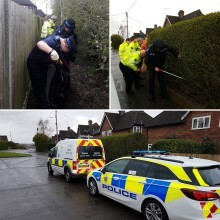 Surrey Police and Guildford Borough Council have worked together to complete a weapons sweep and street clean of Winchester Road and the surrounding areas of Ash today. Last week, four men appeared in court in connection with county lines drug offences across the county. Officers are proactively deterring criminals travelling from outside the county under Op Viking, which has been in operation since late 2016 to disrupt cross county border drug dealing and associated violence across East Surrey. Following our appeal in relation to wanted man Daniel Powell, we are pleased to say he has now been arrested. Breck’s Last Game, a short film about a 14-year-old boy who was murdered by a man he met on a gaming site, is now available to watch in-full. Adam Court, 37, of Station Road in Aldershot, was arrested in the early hours of Monday morning (1 April) and charged with Section 4 of the Public Order Act. Two women approached by man near Farncombe pub - did you see anything? We are appealing for witnesses after two women were approached by a man near the White Hart pub in Farncombe on Saturday evening (30 March). Anniversary appeal - can you help us find missing man John Upton, last seen in March 2018? ​One year since he was reported missing, we are re-appealing for the public’s help in locating a missing 60-year-old man from Camberley. ​A man has been jailed for 44 months after pleading guilty to a robbery at a Redhill shop as well as for possession of a bladed article. A man was jailed for a total of eight and half years in relation to two series of burglaries committed in Surrey and the Thames Valley area when he appeared at court on Friday (22 March). Epsom man appears in court charged with the murder of a woman in Ewell in February. ​An Epsom man has appeared in court today (29 March) charged with the murder of a woman in Ewell in February. We are releasing CCTV images to try and identify any witnesses to an assault in a Knaphill pub last month, which left a man with serious injuries. Update: A woman who went missing from Staines has been found. We’re appealing for information after receiving a report that a man indecently exposed himself to a teenager in the Hinchley Wood area last Wednesday (20 March). 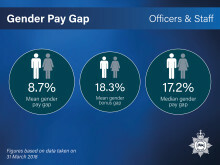 Surrey Police has published its report to the government which highlights a median difference of 17.2%, up from 12.2% last year.